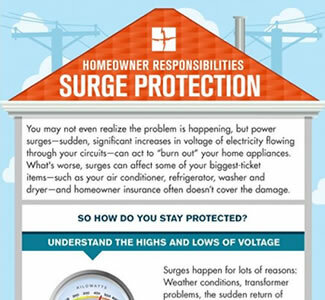 Home > Learning Center > Surge > Electrical Power Surges: Is Your Home Protected? Electrical Power Surges: Is Your Home Protected? Whenever you see a wall of black clouds on the horizon, signaling the arrival of a thunderstorm and lighting, your home voltage is dancing all over the place. And while you may not even realize what's happening, a power surge - a sudden, significant increases in voltage of electricity flowing through your circuits - can harm your home appliances. In fact, these surges can affect some of your biggest-ticket items, including your air conditioner, refrigerator, washer, and dryer, so it's crucial that you check your homeowner's insurance policy to ensure you're covered. How can I protect my home from power surges? When high-powered electrical appliances at peak capacity, it takes a lot of energy to keep their motors and compressors going, so high demand can upset the steady voltage flow through your electrical system. On the other hand, low voltage causes other problems when too little electricity causes motor-driven appliances to overheat, as motors work harder to try and draw more current. Understand the highs and lows of voltage. Normally, your standard home voltage is about 120 volts. During a surge, there is a brief but dramatic increase in that voltage rate, bringing too much electricity running through your wires. Surges happen for many reasons: weather conditions, transformer problems, the sudden return of power after an outage, and more. Know which appliances are most at risk - and why. Anything motor-driven is particularly vulnerable to damage from voltage changes. Also, modern electronics that rely on microprocessors computers, microwaves, TVs, DVD players, and more - need a stable supply of electric current at the proper voltage to work properly. This is why we recommend you unplug all of these major electrical units in a power outage, as there's often a surge when electricity comes back on. Install surge protectors on major items. These devices, which resemble power strips, work automatically to divert extra electricity to each outlet's grounding wire and help protect your appliances. Home computers, media units, land-line telephones, cable lines, and motorized appliances can all benefit from surge protectors, though experts still recommend unplugging major items if there is a power outage. Learn more about how to protect your home from power surges and other electrical problems — and yourself from sudden, unexpected home repair expenses — by viewing our surge protection plans, or calling 1-888-733-1683. Homeowners insurance won't help you if your appliances and electronics are damaged by power surges. Direct Energy's Surge Essentials plan provides repair and replacement coverage you can depend on. Get protected today!